Loafers or moccasins? Cow hide or velvet? Should you go more formal or more casual? Though it may seem difficult, selecting the correct shoes doesn’t have to be rocket science. Here are my tips on choosing the precise pair for every occasion. Any time that I’m headed out to a picnic, or casual family event – even just a night out with the guys, I feel that it’s still important to look put together. I am a modern gentleman after all. I tend to consider where I am headed and what sort of bottoms I’ve got on before selecting shoes. 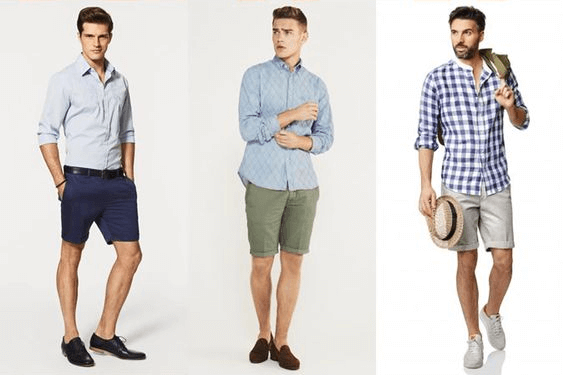 When it’s hot outside, or at the park or beach, and there won’t be any business or formal activities, shorts are always a comfortable and stylish pick. The best shoe pairing for shorts is probably close toed shoes. Sandals, unless you are literally at the beach to swim, are never the proper choice. If you must, or activities will be athletic, consider tennis shoes but paired with ankle socks. Nothing higher than ankle socks will ever look appropriate with shorts. An even better choice may be boaters or loafers, which are casual but not uncomely. These don’t require socks and are more suitable in terms of style. Moccasins are also a fine choice. If the event is slightly more formal than the beach or a picnic, jeans may be the best way to go casual. The most suitable shoe selection would be trainers, Air Jordan’s, or Adidas Yeezy’s, which were designed mainly with style in mind. When I want to go smart casual, meaning slightly looser jeans, I often choose black or brown suede desert boots. This look, paired with a dress shirt, or a t-shirt with a blazer, can be great for a first date or casual meeting as it looks sophisticated and classy. Chelsea boots also work. More formal looking jean and shoe combos are the classic black or brown leather dress shoes with a slim, darker jean. When appropriate, trousers and slacks can be used. A good shoe to pair with chinos, for example, would be any slip-on/boat shoe, penny loafer, or moccasin. Slippers are to be avoided, though. Lace-up boots would be appropriate for colder weather. 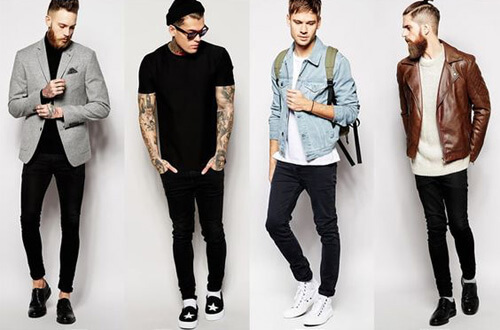 Joggers can also be dressed up a bit when used with desert boots. 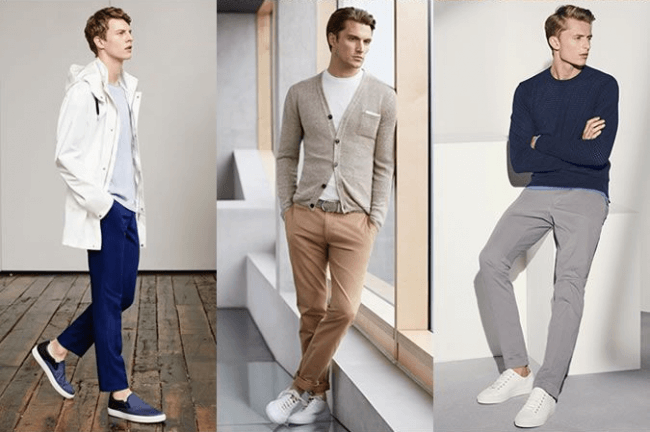 With regular trousers, brogues or derby shoes can look classy, or you can try minimalist sneakers if the emphasis is on the pants. When it comes to business wear – for work, church or semi-formal events – there are a great deal of shoe options. The three basic possibilities are oxfords, brogues, and loafers. These two are the easiest to pair. Black suit equals black shoes – there are no other viable options if you want to be taken seriously. Charcoal is much the same way. To avoid issues, stick with black, or a very deep burgundy. Navy is a prevalent suit color as it is versatile as well. Black, brown, burgundy are all feasible, but keep black for more formal occasions, and oxblood or burgundy for social events. Like navy, but bluer, this is a perfect summer color, and can be paired with oxblood brogues, tan shoes, or black loafers. 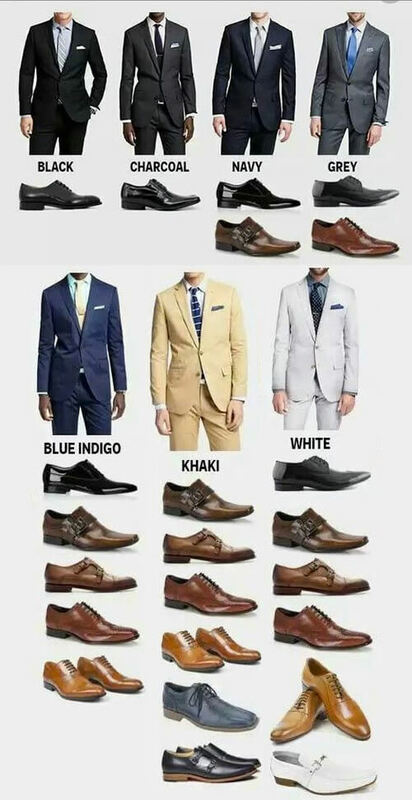 There are a lot of options with this one, but the more colorful the shoes are, the further away the look moves from being professional. Gray suits look best when paired with black or brown shoes. Loafers, lace-ups, and more are all options. Lighter gray suits are definitely best with tan shoes. Pairing with black or brown will work, as well, but tan will take the look to the next level. Also a great summer color, khaki gives you four options of shoe color. Navy, burgundy, brown, or tan can all work with khaki. It’s versatile. These really only can be effectively paired with tan shoes. Suede penny loafers, Oxfords, and bluchers will all look coordinated. Special events are when style (or lack thereof) certainly shows. Wearing tan shoes to a black tie wedding, for example, would be a huge style no-no. No modern gentleman would even dream of doing that. Black tie events are normally tuxedo events, and any shoe worn should be black. There are several styles that may be most appropriate for these events. Patent leather, smooth calf or cow leather, and velvet are all appropriate textures for a formal event. Patent leather would be the classic option, as it seems to be the most formal of all. Brogues should probably be avoided unless the brogueing is very subtle and unpretentious. A surer option would be black loafers. Avoid tassels and penny loafers, though. Oxfords or bluchers will also do. If one chooses to go the velvet route, they should stick with Prince Albert Slippers. Traditionally, however, slippers and velvet have been worn only by the host or a gentleman at his own club. Smooth cow leather is a more economical option to patent leather, and as long as it is highly shined, should do the trick. I prefer to wear my black cow leather oxfords with tuxedos. When attending a white tie event, patent leather is really the only option for shoe material, and it goes the other way around as well: patent leather is never to be worn outside of formal or semi-formal events. Do you need to take your Shoes off at the Door? Now for the age-old question that no one seems to really know the answer to: When is it proper to remove shoes upon entering a home? The real answer is more complicated than simple, and has something to do with where you’re at. In most Western countries, it depends completely upon your host and whether or not they expect shoes to be removed. If they make a reasonable request, simply remove your shoes. You should always have a clean, hole-less pair of socks on underneath so as not to cause any problems. Many hosts choose the shoe removal option due to health issues, traditions, or to prevent carpet or floors from becoming muddy. When unsure about your hosts shoe policy, just ask. I personally wear clean socks, and then ask my host if he would like me to remove my shoes at the door. If you’re hosting a party at home and would like guests to remove shoes, it’s always polite to warn them ahead of time. Let them know they are free to bring their favorite pair of slippers or socks, or offer a new pair of socks for your guests that they can take home. 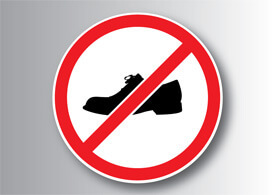 That way, no one will buy a new, spiffy pair of shoes and then not even get to wear them! Always provide a neat space for shoes to be placed, such as a shelf or rack. Piling shoes in containers or on the floor can damage them and cause a mess. Now, what about your shoes during that business trip out-of-country? In some Asian countries, like Japan and Indonesia, shoes are regularly removed, as wearing dirty shoes into the house is a sign of disrespect. The Japanese even have a genkan, which is a special entry way designed to leave shoes in. In Arab culture, shoes have been used as a method of insult for a long while. Because shoes are constantly in contact with the ground, they’re considered dirty. It’s actually culturally rude to cross your leg, or ankle over knee because the sole of the shoe (the dirtiest part) will be showing. In mosques and before prayers, shoes are to be removed – no exceptions. Though it is done a little differently in every part of the world, you can rest assured that no matter where you are (and whether or not you must take them off), a nicely paired shoe is the way to go – after all, you can still tell a gentleman by his shoes.